David Talbot, in Brothers, writes that Bobby Kennedy was the first conspiracy theorist. The very day of his brother’s murder, he suspected something. That suspicion did not subside during the months of grief that followed. Colleagues, family and friends asked him why he didn’t follow up on his intuition. After all, he was still the attorney general. If he would lead an investigation, he would be doing right by his brother, right by the people who supported his brother, and right by his country. Bobby replied, “What good would it do? It won’t bring my brother back.” Talbot also notes that Bobby could not have led an investigation even if he had wanted to. He was entirely isolated in the new administration. Lyndon Johnson and J. Edgar Hoover hated him. Johnson wanted him gone, but it would not look good to fire the assassinated president’s brother. 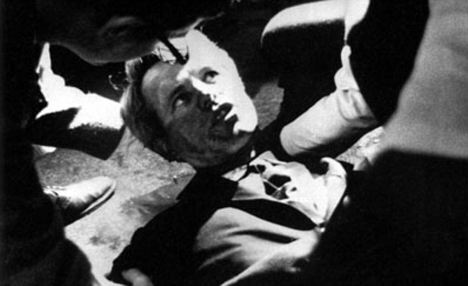 Bobby Kennedy could have poked around a bit as a private citizen, but he was not a private citizen. When he left the Johnson administration and became a private citizen, he did poke around a bit, but that was all. I read once that Bobby showed extraordinary courage when he decided to run for president in 1968. He made his decision shortly before Johnson withdrew from the race. It took some political backbone to take on a sitting president. The courage in question, though, was not political but moral and personal. Bobby knew that if he was correct about a conspiracy to kill his brother in 1963, the same thing could happen to him in 1968, or shortly after. As soon as it looked like he might become president, he would become a dangerous person for the people who killed Jack. He won the California primary on June 4, 1968, and he was gunned down shortly after midnight the same evening. Some timing. Bobby Kennedy, shot at the Ambassador Hotel in Los Angeles, June 5, 1968. Can our country – all of us as citizens – demonstrate similar courage? Some people don’t think we lost our republic on November 22, 1963. They think Oswald did it and we have to move on. Others believe the murder amounted to a coup d’etat, but echo Bobby’s initial, hopeless response to the idea that we ought to do something about it: “What good would it do? It won’t bring our republic back.” Others believe our republic began to slip away in 1963, and want to rectify the effects of this crime. That was Bobby’s attitude in 1968. The problem with this attitude, of course, is that we as citizens face the same consequences Bobby faced. Government has the capacity to kill us. It has the capacity to imprison us, to confine us to small cells twenty-three hours a day. It constantly demonstrates its willingness to use powerful instruments of intimidation and cruelty to protect its power and keep citizens quiescent. If you want to resist our government, as Edward Snowden has, you have to have the courage of Bobby Kennedy. You have to be willing to give your life.